When I picked up the process of KonMari once again this summer, I began with clothes. 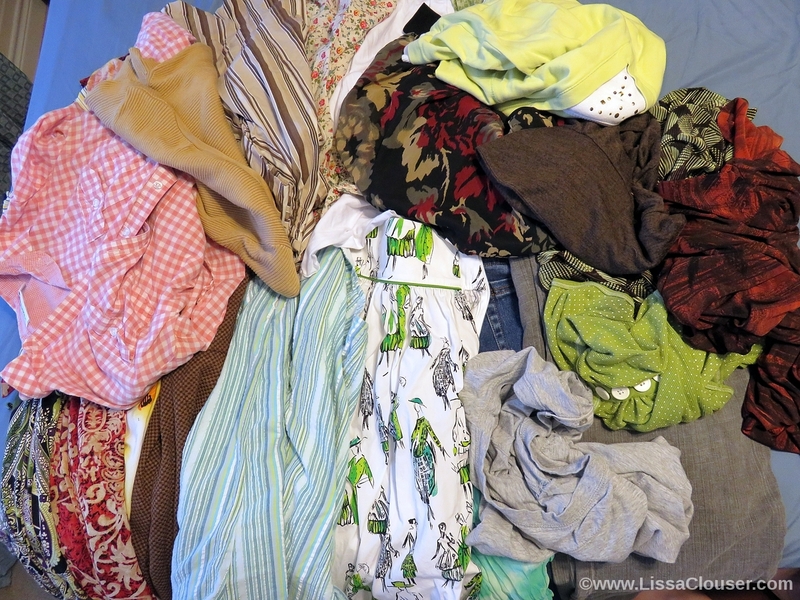 My husband’s wardrobe hasn’t changed too drastically, so I left his alone, but mine had seen at least one more big thrift store sale as well as new purchases this spring before going on international vacation. It needed going through. I will admit that this is all I bagged up to donate. Just 25 items. But it was so much easier going through my closet this time around. Not to mention I was also pulling from an already heavily reduced inventory. I couldn’t really expect to pull 100 or more items. There are a few pieces I almost pulled for the donation pile this time, but I’m not quite ready to let go and if I still don’t touch them for another six months it won’t be so difficult. Doing this a second time I was able to more easily tell my feelings about the clothes I had. The skirts that were a little too short, the shirts that didn’t quite stretch long enough, the dresses that were worn less now that I had others I liked better to wear… all were so much easier to thank for once being mine and let go. Yes, I do still thank things out loud, both when I keep them and when I let them go, as I go through the KonMari process. For some, this part of the method is more metaphorical. They use it to simply be conscious of their decisions and the reasoning behind them. For me I take it a bit more literally. It works for me. I talk to the objects in my house frequently, so why would I not talk to them when figuring out whether or not they will remain a part of my household? I would like to be able to keep up the process of going through my clothes about once a year. It would keep my closet from getting out of hand, and also keep me aware of whether or not the things I’m keeping are actually being used. Not to mention, it just feels good to open your closet and see only things you love to wear.